speak without words to the outer world. 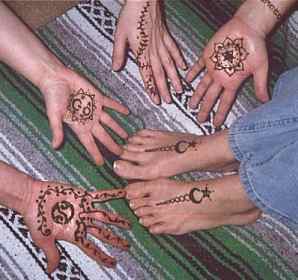 This ancient tradition has been, and still is, practiced and shared by women for thousands of years from North Africa to India to Indonesia. American women are discovering this lovely creative act that can be done alone or shared with friends as a social experience that also provides a respite from their busy everyday lives. and the stain is set with a natural fixative. 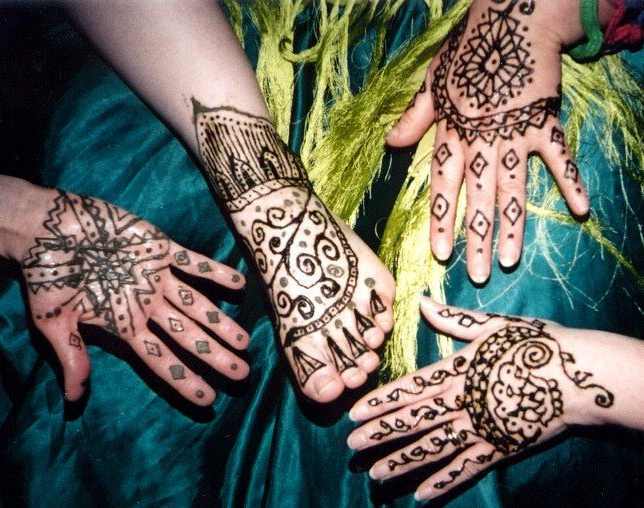 "How long does a henna design take?" Expect to sit and relax for at least an hour to develop a strong color (generally, the longer it sets, the darker the stain). will darken over the next 48 hours. and where it is applied on the body. "Where is the best place for a design?" Hands & feet take the color best, especially the palms and soles. "How do you care for your design?" Frequent moisturizing of the skin lengthens the life of your design.